Shorthand is any system of accelerated handwriting used for the transcription of the spoken word. Shorthand systems use a variety of techniques including simplifying existing letters or characters, and using special symbols to represent phonemes, words and phrases. A typical shorthand system provides symbols or abbreviations for words and common phrases, allowing someone well trained in the system to write as quickly as people speak. Typically, shorthand notes are intended either for immediate use or for later transcription to longhand and are therefore, temporary in nature. Although a disadvantage of mastering shorthand is the learning curve involved to become proficient, it can increase the user’s speed of writing and ability to record the spoken word up to 200 words per minute depending on one’s command of the skill. The average person can only write at approximately 30 words per minute. Knowledge of Shorthand aids in the development of skills related to listening, focus, organization, attention to detail and accuracy. It allows for efficiency and organization of thought in that the speaker can free flow their intended content while the person taking the dictation has only to record what is being said. Among the most popular modern Shorthand systems before the invention of the computer were Pitman, Gregg, Teeline, and Speedwriting. These formal methods of Shorthand were referred to as stenography (close, little, or narrow writing), stachygraphy (swift writing) and brachygraphy (short writing). Prior to the invention of recording machines (including typewriters) and ultimately computers, shorthand was the most widely used method for taking dictation and notes for business correspondence. Before recording devices, shorthand was vital to businesses, medical communities and the law. A good stenographer could make a decent living, and this skill improved the lives of thousands of men and women. At the turn of the 20th C, the mechanization of shorthand became commercially feasible when American stenographer and court reporter Ward Stone Ireland introduced the Stenotype machine. 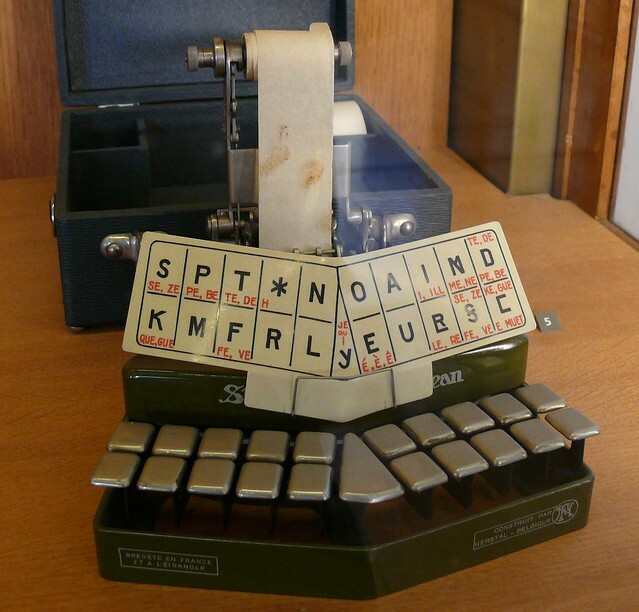 Both the Stenograph and Stenotype machines have keyboards with 22 keys arranged so that the operator, using all fingers and both thumbs, is able to strike any number of keys simultaneously. The machines print roman letters on a strip of paper that folds automatically into the back of the machine. The operator controls the keys by touch and is thus able to watch the speaker. Although the machines were used in offices to some extent, they were primarily utilized for purposes of court reporting as well as for recording conferences. 1837 – Isaac Pitman – British, invented Pitman shorthand, a modern symbol system based on sounds. Words are written as they sound, not as they are spelled. 1888 – John Robert Gregg – Irish, invented Gregg Shorthand, a modern symbol system which superseded Pittman’s method as most predominantly used. 1924 – Emma Dearborn – Instructor at Columbia University, invented the Speedwriting Shorthand system. It requires the memorization of unique abbreviations to corresponding words. 1970 – James Hill – British, invented Teeline Shorthand. The primary use of shorthand has been to record oral dictation or discourse, and various methods were used for the demands of office administration (secretarial), journalism and court reporting. The Industrial Revolution brought a demand for stenographers in business. The geometric system then in use was complicated and required a high level of training. Because of this, a need existed for a simplified method of shorthand and in 1817 German Franz Xaver Gabelsberger inspired a simple cursive system. In 1893 John Robert Gregg introduced his system to the United States and found that shorthand was virtually unknown. It was during this time that high schools began teaching shorthand and Gregg traveled throughout the United States demonstrating his system, as well as his teaching methods, with tremendous success. Gregg Shorthand became the most predominant system taught and used in the United States, Canada and Britain. Also during this period the United States’ flourishing economy, particularly on the East Coast, created a demand for schools that taught stenography and secretarial practices. This included courses in stenography, typing, proof reading and other commercial skills; all of which were considered valuable, particularly for women who were now entering the workforce. After the mid-1880s, a substantial share (but never a majority) of female clerical workers were employed as stenographers and typists. It was viewed that these skills created an ideal opening for women who sought to make their own living. Up until that time it was their male counterparts who were employed in these clerical positions. However, the men began moving into other areas, primarily in management. From an economic viewpoint women were paid lower wages, which could translate into a more profitable bottom line for their employers. Although the primary use of shorthand has been to record oral dictation or discourse, some systems are used for compact expression. For example, health-care professionals may use shorthand notes in medical charts and correspondence. Throughout the centuries shorthand was also used for cultural pursuits, and because of this was considered an art form. For example, George Bernard Shaw created his works using the Pitman Shorthand method. By the late 19th C shorthand was regarded as a clerical skill more than an art form, and by the late 20th C speech recognition devices were being developed, which greatly diminished the role of shorthand written with pen and paper. The demise of shorthand can be seen as part of modernization with the invention of voice recording tools allowing speakers to talk directly into a recording device. A person can now speak into a tape recorder, enabling their assistant to transcribe word for word, directly into a typewriter or word processor. Increasingly, assistants now receive written drafts rather than oral communications and have only editing and proofreading to complete. Shorthand was originally developed as a method for capturing the spoken word. It was authentic in terms of representing and accurately preserving orality. It allowed for spontaneity on the part of the orator and allowed thoughts to flow freely. Before the introduction of digital voice recorders, shorthand served to preserve the magic of an oral performance, incorporating knowledge, understanding, creative thought and insight into the material. The transcription provided written access to that performance, and along with it the ability to revisit and tap into both the wisdom delivered and wisdom gained. Invented by men and later employed primarily by women, shorthand is considered a mechanical skill and it’s a difficult argument to defend its academic relevance. While it was never developed as a tool for literacy and education, it was used by those who were both literate and educated. Shorthand set the stage for the later development of more sophisticated recording technologies. Modernization and the advancement of voice recording technologies have diminished the value of shorthand as a writing technology. Although rarely used today, many people who know how to use it maintain that it provides the benefits of improved memory, multitasking of the brain, increased power of retention, improved organization and increased productivity. Despite these benefits and Shorthand’s use throughout past centuries and across diverse cultures, it has now become virtually obsolete as a commercial skill, as a written method of preserving orality, and as an art form. This entry was posted in Research Paper, Uncategorized and tagged history, Research, Shorthand, Writing System. Bookmark the permalink. 4 Responses to SHORTHAND – CAN YOU WRITE AS FAST AS YOU SPEAK? Interesting, I enjoyed reading your post and learned a lot. Thanks for educating me. Good job! Reading through your post I see that shorthand has a long history. From 4th century BC it evolved (remediation) from scripts to its mechanisation with invention of stenograph making it more accessible which placed it more in public hands, to the use of recorders for ease of use. It’ interesting to see how shorthand may have influenced the early beginnings of the typewriter and the computer keyboard (QWERTY) as we know it today. While this remediation was taking place it was carving out a niche, creating job opportunities that required specialised skills and abilities hence shorthand in itself could be called a form of “techne.” Botler, D (2001) “for the Greeks a techne could be an art or craft, a set of rules, system or method of making or doing whether of the useful arts, or of the fine arts” (Lidell & Scott, 1973, p.1,785).” Its influence can also be seen in its adoption into the school system as a course of study grooming professionals to fill positions for jobs it created thus empowering people. However, technology has moved recording speech and transcription to recorders that can be used to record oral dictation and can later be transcribed using computer software as you playback the recording. This is to mention a few. Writing shorthand has been influenced from symbolic drawing to abbreviations of words and sentences. Thanks for the overview, this was a very interesting read. I had no idea that shorthand had such a long history, and I do wonder where we go from here. Love it or hate it (personally, I’m the latter of the two), chat has meant a morphing of our language into a new sort of shorthand. It’s interesting though how these new shorthand terms have developed – it appears to me to have been far less formulaic than how shorthand developed. With the growth of the keyboard and our ability to type faster than we write and as Brian suggests the space of chat, shorthand has definitely made it’s way in a less formal sense and changed its place in our world now. Your paper has some links to mine (the phenomenology of writing). Your discussion of “female clerical employment and adoption of new office technology” relates to my discussion on the role of the typewriter on women. The typewriter played a role in their entry into the workforce and had impacts on social status/structures. It would be interesting to look at the typewriter and shorthand together and their reciprocal relationship.